THE NEW TEEN TITANS #38, THE NEW TEEN TITANS #50, NEW TITANS #50, NEW TITANS #51, NEW TITANS #52, NEW TITANS #53, NEW TITANS #54, NEW TITANS #55 and TEEN TITANS/OUTSIDERS SECRET FILES 2003. Diamond has released the actual sales data for June 2005. Marvel edged DC to claim the number one spot in both the dollar and unit share. The top ten trades or graphic novels included: We3, Marvel 1602, Fruits Basket Vol. 10, Ultimate Fantastic Four Vol. 3, Batman War Games Act 2, Superman Infinite City, Superman Godfall, New Teen Titans: Who is Donna Troy, Essential Fantastic Four Vol. 4, and The Life and Times of Scrooge McDuck. WOLFMAN: JUST WHO IS DONNA TROY? She's not the Phoenix, but Donna Troy is rising from her ashes in a story tied to the upcoming DC mega event, Infinite Crisis. Troy, the former Wonder Girl, met with an untimely demise in the Graduation Day limited series. Her end signaled the beginning of two new super teams: the Outsiders and a new group of Teen Titans. Shortly after the denouement of Graduation Day, rumors began to circulate that the death of Donna Troy was not the end and that - even then - plans were in place to reintroduce her to the DCU. Now, two years later, as the first part of The Return of Donna Troy is upon us, DC Comics has also released a "best of" 224 page collection, New Teen Titans: Who is Donna Troy. One of the best New Teen Titans stories in fan opinion was the origin of Donna Troy. Wolfman said it was Perez who thought they should go "further" and "find out who her parents were that I had 'die' in the fire," Wolfman said. "George came up with the idea of presenting it as a mystery. The hardest part of the story was making it work as both a piece of detection and an emotional story." Judging by fan reaction and DC's decision to include it in the collection, Wolfman and Perez succeeded. Wolfman considers it one of his all time favorite stories in the Titans mythos. Another thing Wolfman enjoyed doing for the character was giving her a soulmate in the form of divorced college professor Terry Long. "I thought someone with WG's background could never be happy with a boy her own age. He had to be a man. Older. Who had gone through life - in his case a marriage and kids - and, to make them more compatible, he was a History professor so he could understand and he awed by what she had seen and done in her short lifetime. After all, she had walked with the Gods that he studied and thought of as myth. He simply had to be older. Boys her age would be like dating the emotional equivalent of a two year old - which is what most 18 year old boys are anyway." WIZARD: What's your favorite Fantastic Four tale that you drew? PEREZ: The issue with the Impossible Man [#176]. The fun part was drawing myself and [writer] Roy Thomas - boy, did I look good in those days! - and having my comic book self talking to Jack Kirby whom I had never met and wouldn't meet for the first time until 1985. What was best about working on FF? It was a nice learning experience for me. I got to add another notch in my gun as far as establishing myself as an artist who really likes doing group books. 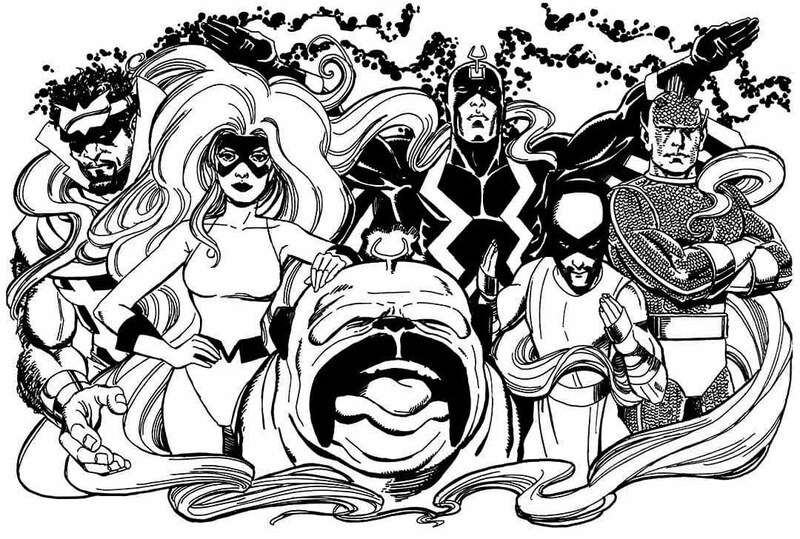 I was doing Avengers and Inhumans around the same time. A standout New Teen Titans tale you penciled - #38, "Who is Donna Troy?" -will be included in the new collection. So who is Donna Troy to you? I think Donna Troy will always be a feminine ideal who's basically the girl next door that everyone just has to fall in love with. She was rather perfect in her own way - strong, intelligent, giving, loving and of course, gorgeous. But who wins in a fight between Donna Troy and the Thing? In the long run, it would probably be Donna because Ben would be a little reluctant to use all his strength at first on a female character, despite his experience with Thundra and everyone else. That one brief hesitation is all she needs. What will your next big project be after the Teen Titans: Games graphic novel? Nothing specific at this point because Games won't be finished until the end of the year. A lot of people have been coming up with a lot of proposals. I'm very flattered that at my age, I'm still being considered the pretty girl at the prom. [Chuckles] it's very humbling and I'm gratified. What are the chances of seeing a trade collecting the most popular Troia appearances? Ask and ye shall receive! A 224-page collection called THE NEW TEEN TITANS: WHO IS DONNA TROY? is coming this June! It will contain Donna's most essential and highly-requested stories: THE NEW TEEN TITANS #38 "Who is Donna Troy? "; THE NEW TEEN TITANS #50, "We Are Gathered Here Today..."; NEW TITANS #50-55 "Who is Wonder Girl? "; and her eulogy from TEEN TITANS/OUTSIDERS SECRET FILES 2003.